We are honoring our Mother’s wishes no funeral, no memorial, no viewing, just cremation and scattering of her ashes privately with family in August of 2019. Thank you for your inquiry, calls, card, flowers, most of all your prayers. Mrs. Kyoko Anderson was born in Asahikawa, Japanto the union of her parents Matsumosuki and Kiyo Yoshida. She was the third to the oldest of 3 sisters and 2 brothers who along with their parents were business owners which continues spanning three generations. Kyoko attended an exclusive school for girls where she wrote for the school newspaper and took additional classes in sewing leading to her designing beautiful Japanese bags and dresses. Kyoko immigrated to the United States 61 years ago uniting in matrimony to the late Mr. Willie Anderson, a member of the U. S. Air Force. She proudly obtained her citizenship in 1970. Kyoko was employed at Everett Medical Center as a housekeeper and went on to receive training as a specialized sanitation worker for the medical center. Upon her retirement, Kyoko was honored by the medical center staff for her excellence by presenting her with ruby and diamond earrings. Kyoko leaves to mourn one sister, Eiko Yoshida and her husband, Aichi and nephew Kosuki and his wife, Michiyo in Asahikawa, Japan. She is survived by her daughter, Margie Tynes and her husband, Derek, daughter, Diana Benton and her husband, Chip and son, David and his wife Gen. Kyoko is also survived by her grandchildren, Eric, Seana, Justin and Simone. 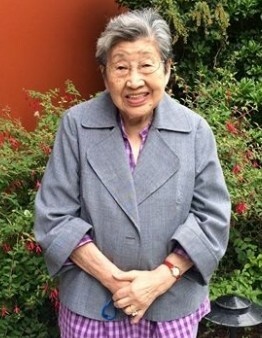 Kyoko was a Kawabe House resident for 21 years, received numerous community service awards and was especially proud of leading the “Ocha-no-Kai” for the Japanese Resident Association. She died peacefully with her family by her side.